What a treat to photograph Tyler and Brooke’s Flagstaff engagement session last Sunday. Going to the high country of Arizona is always special in itself, but to get to play in the snow with my clients, oh boy! Last week I received an email from Brooke asking if there was any chance I could make it up to Flagstaff to shoot their engagement session. Snow was on the ground which offered a fun environment for the session. Waiting a few weekends would have no guarantee that there would be any snow as we are into March now. Fortunately, my schedule was clear and I was excited to head up “the hill” to Flag. It’s not very often we get to shoot in the snow here in AZ. Although this winter, Lady Luck has been on my side as I was able to do a Payson engagement session in the snow a few weeks earlier. Sometimes you get lucky. As I headed up to Flag, the temperature quickly started falling. It never ceases to amaze me how you can leave 60 degree weather in Phoenix and within 2.5 hours be in 30 degree (or lower) weather. Pulling into Flag and seeing all the white stuff made me as giddy as grade school kid getting to play in the snow. I met up with Brook and Tyler to plan out our adventure. 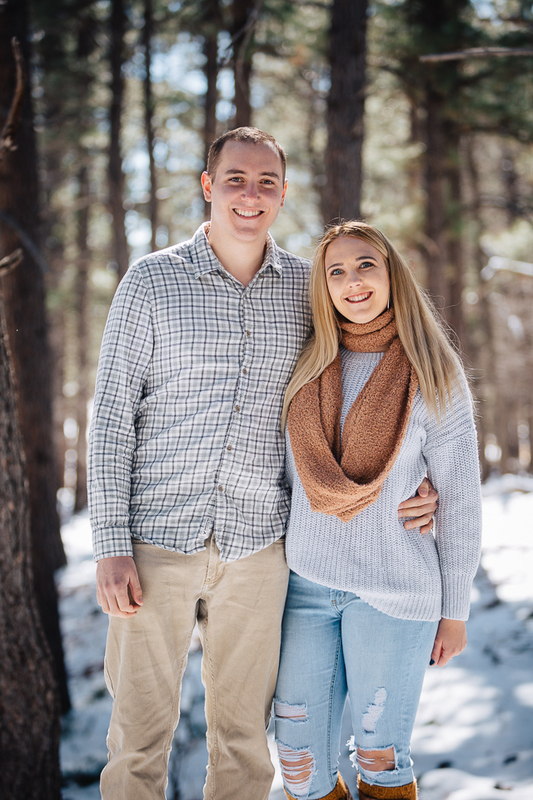 Our first stop would be Buffalo Park, then up towards the ski resort Snow Bowl for a stop at Aspen Corner, then finish up back in town on the campus of Northern Arizona University where Brooke and Tyler attend. Buffalo Park was a great choice by Brooke and Tyler. It offered open views of the surrounding mountains, including Mount Humphreys home to Snow Bowl. Wrapping up we made our way towards Aspen Corner. I was super stoked to get some snow pics there with the Aspens. As we rounded the corner I noticed there were no cars whatsoever. That never happens here so I feared the worst. The Forest Service had posted “No Parking” signs everywhere. Ugh. My heart sank. We continued on up to Snow Bowl to see if we could find other pullouts along the way but the Forest Service had already marked those as well with “no parking” signs. With a huge disappointment we made our back into Flag to shoot on the campus of NAU. Brooke and Tyler were troopers and shook off the loss with no problem. We got some great shots around the campus and finished up with a few more in Flag. What a fun adventure that was unplanned but oh so enjoyable. I can’t wait for Brooke and Tyler’s wedding this fall here in Phoenix. These two were great to hang with and we had so much fun. Below you will find a few of my favorites from their session.